"Carotid" and "carotids" redirect here. For the parotids (salivary glands), see Parotid gland. The common carotid artery arises directly from the aorta on the left and as a branch of the brachiocephalic trunk on the right. The common carotid arteries are present on the left and right sides of the body. These arteries originate from different arteries but follow symmetrical courses. The right common carotid originates in the neck from the brachiocephalic trunk; the left from the aortic arch in the thorax. These split into the external and internal carotid arteries at the upper border of the thyroid cartilage, at around the level of the fourth cervical vertebra. The left common carotid artery can be thought of as having two parts: a thoracic (chest) part and a cervical (neck) part. The right common carotid originates in or close to the neck and contains only a small thoracic portion. There are studies in the bioengineering literature that have looked into characterizing the geometric structure of the common carotid artery from both qualitative and mathematical (quantitative) standpoints. Only the left common carotid artery has a substantial presence in the thorax. It originates directly from the aortic arch, and travels upward through the superior mediastinum to the level of the left sternoclavicular joint. At the lower neck the two common carotid arteries are separated from each other by a very narrow interval which contains the trachea; but at the upper part, the thyroid gland, the larynx and pharynx separate the two arteries. 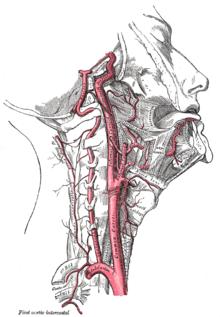 The common carotid artery is contained in a sheath known as the carotid sheath, which is derived from the deep cervical fascia and encloses also the internal jugular vein and vagus nerve, the vein lying lateral to the artery, and the nerve between the artery and vein, on a plane posterior to both. On opening the sheath, each of these three structures is seen to have a separate fibrous cover. At approximately the level of the fourth cervical vertebra, the common carotid artery splits ("bifurcates" in literature) into an internal carotid artery (ICA) and an external carotid artery (ECA). While both branches travel upward, the internal carotid takes a deeper (more internal) path, eventually travelling up into the skull to supply the brain. The external carotid artery travels more closely to the surface, and sends off numerous branches that supply the neck and face. The right common carotid may rise above the level of the upper border of the sternoclavicular joint; this variation occurs in about 12 percent of cases. In other cases, the artery on the right side may arise as a separate branch from the arch of the aorta, or in conjunction with the left carotid. The common carotid artery is often used in measuring the pulse, especially in patients who are in shock and who lack a detectable pulse in the more peripheral arteries of the body. The pulse is taken by palpating the artery just deep to the anterior border of the sternocleidomastoid muscle at the level of the superior border of the thyroid cartilage. ^ a b Ashrafian H (March 2007). "Anatomically specific clinical examination of the carotid arterial tree". Anatomical Science International. 82 (1): 16–23. doi:10.1111/j.1447-073X.2006.00152.x. PMID 17370446. ^ a b Manbachi A, Hoi Y, Wasserman BA, Lakatta EG, Steinman DA (December 2011). "On the shape of the common carotid artery with implications for blood velocity profiles". Physiological Measurement. 32 (12): 1885–97. doi:10.1088/0967-3334/32/12/001. PMC 3494738. PMID 22031538. ^ J. Krejza; M. Arkuszewski; S. Kasner; J. Weigele; A. Ustymowicz; R. Hurst; B. Cucchiara; S. Messe (April 2006). 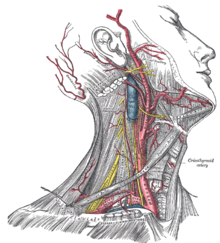 "Carotid Artery Diameter in Men and Women and the Relation to Body and Neck Size". Stroke. 37 (4): 1103–1105. doi:10.1161/01.STR.0000206440.48756.f7. PMID 16497983. ^ Provost, E; Madhloum, N; Int Panis, L; De Boever, P; Nawrot, T (2015). "Carotid Intima-Media Thickness, a Marker of Subclinical Atherosclerosis, and Particulate Air Pollution Exposure: the Meta-Analytical Evidence". PLOS ONE. 10 (5): e0127014. doi:10.1371/journal.pone.0127014. PMC 4430520. PMID 25970426. 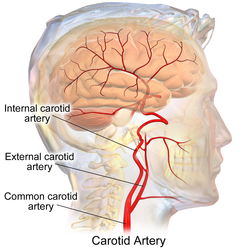 Wikimedia Commons has media related to Common carotid artery.